Introducing new Christmas sets featuring truly unique and hard to find Orthodox gifts – Murano Glass Crosses from Venice, Italy! Ancient one-of a-kind Murano glass jewelry combined with unique panoramic Christmas cards make perfect orthodox gifts! 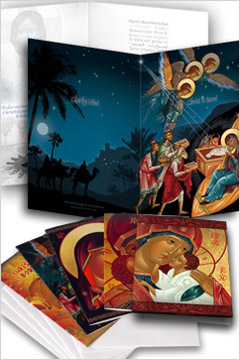 These popular Nativity Christmas card sets feature 5 panoramic card designs with Orthodox Christmas greeting “Christ is Born!” with the reply “Glorify Him!”. Inside the cards there are pictures of a 14-pointed silver star below the Altar of the Nativity that marks the spot inside the The Church of the Nativity in Bethlehem – the birth place of Jesus Christ or pictures of angels. You can order these cards in sets directly from this web site. Besides this Adoration of Magi design there are several more Nativity Christmas cards in the pre-printed cards section as well as at our Zazzle store where you have an option of creating customized Christmas cards and ordering them in small quantities. Please, note that discounts offered at Zazzle are not applicable for our pre-printed Christmas cards sold on this page. Other orthodox gifts include Frankincense and Myrrh oil and perfume, silver and gold orthodox cross necklaces. What is Frankincense and Myrrh Used For?